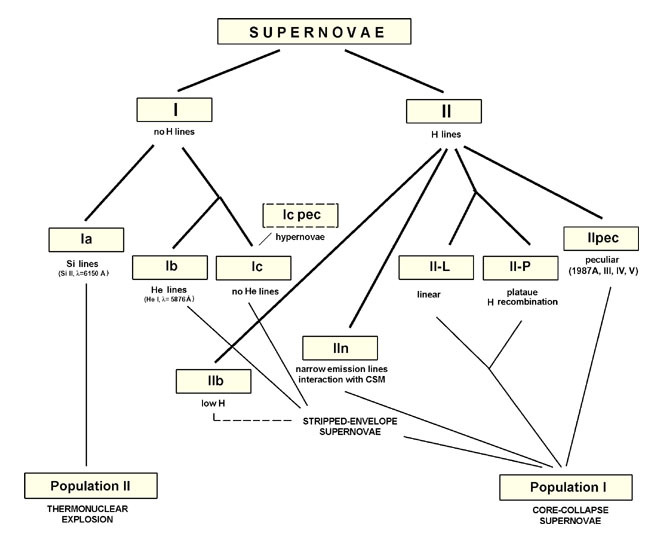 Generally accepted scheme distinguishes two main classes of supernovae (SNe): Ia resulting from the old stellar population (thermonuclear explosion of a white dwarf, or a merger of two white dwarfs in a close binary system), and SNe of type II and Ib/c whose ancestors are young massive stars (died in a core-collapse explosion). Historically, classification of SNe, according to their optical spectra, began by recognizing SNe I, with no hydrogen lines, and SNe II which do show hydrogen in their spectra. In addition, SNe II were shown to exhibit much wider photometric behavior than SNe I, which seemed to be a rather homogeneous class of objects. Nevertheless, it was shown later that there are actually two spectroscopically and photometrically distinct subclasses of SNe I: Ia located only in ellipticals, and Ib found in HII regions and spiral arms, which strongly suggested that their progenitors were massive young stars with their hydrogen envelopes stripped. The third subclass, SNe Ic, discovered later, show no helium lines either, and thus correspond to massive stars stripped of their H and He envelopes. Core-collapse supernovae, as their name suggests, are following the formation of compact stellar remnants: neutron stars and black holes. SN Ia are known in astronomy as the "standard candles". Better understanding of some type II events (e.g. SNe II-P) and stripped-envelope SNe (Ib/c) could lead to their potential use as distance indicators as well. The problem of extinction is the most important issue to be dealt with in the process of obtaining true SN luminosities (absolute magnitudes). The plane-parallel model which gives absorption dependent on galaxy inclination (A ~ sec i), widely used in the past, was shown not to describe extinction adequately. There is some hope in an alternative model which introduces radial dependence of extinction, but further investigation is necessary. for thousands, and in extreme cases even for a million years. and Mo is the mass of the ejecta. may be significant declaration even in this phase. a SNR enters the second phase of evolution. During this phase the shock wave decelerates according to the law v = dR/dt = 2R/(5t), i.e. R = 1.17 (Eo/ρo)1/5t2/5, which is the well known Sedov's solution for a point-like explosion in uniform medium with density ρo. When the temperature behind the shock drops the energy loses due to radiation become significant and a remnant enters the radiative phase of evolution. It is expected in this epoch that SNR undergos a phase of dense shell formation. The remnant continues to expand as pressure-driven, (R ~ t2/7) or momentum-conserving snowplow (R ~ t1/4). Finally, when the expansion velocity becomes comparable with the sound speed in the surroundings, v2 ~ cs2 = γpo/ρo, supernova remnant will merge with the interstellar medium and the evolution ends. An interesting issue concerning SNRs is the question of their radio evolution or the so called Σ–D (surface brightness to diameter) relation which can be written in the form Σ = A D-β. Since parameters of the explosion (Eo, Mo) and the expansion (ρo) may substantially differ from remnant to remnant, it has been generally accepted that no single Σ–D relation can be constructed for all SNRs. However, it still might be possible to construct the relations for some classes of SNRs. This would be of great practical importance for estimation of distances to SNRs when no other methods are available. Although they are known as relatively strong synchrotron radio sources, SNRs can also be observed in optical. In optical search for supernova remnants we use the fact that the optical spectra of SNRs have elevated [S II] : Hα emission-line ratios, as compared to the spectra of normal HII regions. This emission ratio has proven to be an accurate means of differentiating between shock-heated SNRs (ratios > 0.4, but often considerably higher) and photoionized nebulae (0.4, but typically < 0.2). The physical basis for this is as follows: in typical H II regions, sulfur exists mainly in the form of S++, yielding low [S II] λλ 6717,6731 to Hα emission ratios. After the shock wave from an SN explosion has propagated through the surrounding medium and the material has cooled sufficiently, a variety of ionization states are present, including S+. This accounts for the increased [S II] : Hα observed in SNRs. Hα image of HII regions and a possible hypernova remnant in Holmberg IX in M81 galaxy group, obtained with 2m RCC telescope at NAO Rozhen, Bulgaria. AN ANALYSIS OF THE BROADBAND (22-3900 MHz) RADIO SPECTRUM OF HB 3 (G132.7+1.3): THE DETECTION OF THERMAL RADIO EMISSION FROM AN EVOLVED SUPERNOVA REMNANT?